If you’ve got a Play Station 3 or you just happen to be a geek, you’ve probably already heard of this. Folding@Home is a Stanford project which distributes “work-loads” to computers all over the world to calculate protein folding simulations faster. Any computer can contribute by simply downloading a little app from their website, which will utilize your machine’s CPU when it is idle. The 2.6 million machines currently participating produce 288 teraflops of computing power. Nvidia is excited since the new software they created to utilize their GeForce GPUs is going to help speed up the process faster than ever. The 24,300 machines using Nvidia GPUs in the Folding@Home program are now contributing 1.4 petaflops, which is five times the amount of power the CPUs in the project are offering. The folks over at RTT are using Nvidia graphics technologies to create real-time raytracing models of prototype cars. 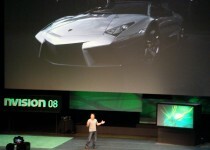 Jen-Hsun invited Peter Stevenson, COO of RTT, on stage to show us a live demo of a new prototype Lamborghini model. The car apparently costs over a million dollars and only 20 will become available worldwide. Changes to the virtual model can be made in real-time and is intricate enough to detail every single internal component of the vehicle, not just the exterior looks. The high quality details of the interior leather, stitching, and materials was quite impressive. Nike, for example, was able to save a couple million dollars using Nvidia to create virtual prototypes of shoes. Next, Nvidia’s CEO introduced Taehoon Kim, co-founder of Nurien, who introduced a new Massive Multi-player Online game which is going to be released soon. It was pretty much Sims, but on steroids. (Lots of Steroids.) The game could render people in real time, simulate life-like movements, and looks damn good. Another neat feature that they mentioned was the ability to choose real videos to be playing on TV screens or uploaded photos on photo frames in virtual homes, so other players who enter your area will be able to see all of your personalized content since every component of the game is networked. If you watch Football or paid any attention to the 2008 Olympics, you probably have noticed a lot of virtual graphics being added to the arena. For example in the swimming events, a line is overlaid on the screen to show the time that the contestants would need to beat to reach a world record. The graphics was added without harming the view of the athletes and this was done using GPUs to calculate fluid movement around objects. NASCAR is using Sportsvision technology to display the effects of drafting. A new product Microsoft just launched a couple of days ago allows stitching multiple photos together in a virtual environment. It automatically creates reference points from objects in images and can put them together, the more photos the better. Joshua Edwards from Microsoft Live Labs previewed some samples of the Stonehenge in the U.K. and the National Archive building in D.C. in impressive detail. The best part is that anyone can create these high quality 360 virtual views of an area with just a digital camera. 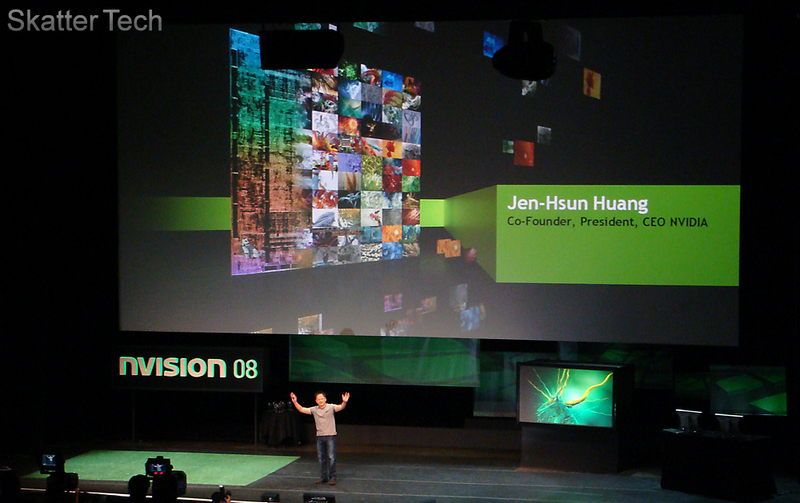 Jeff Han stepped on stage to demonstrate the next generation user interfaces. Perceptive Pixel has taken UI graphics to the next level. He used a whopping 100-inch multi-touch display to demonstrate some stuff you can’t do with a mouse. Although he expects first practical applications to be for the military and high-end design, he expects simpler versions to reach consumers soon. And it already has with touch screen devices such as the Apple iPhone. I started making my way back to the expo hall, but Tricia Helfer, an actress, who’s on Battlestar Galactica and Burn Notice, was speaking about how virtual characters play a role in television. Nvidia plays a huge roll to make much of the graphics we see in Hollywood films actually be rendered and put on the big screen. 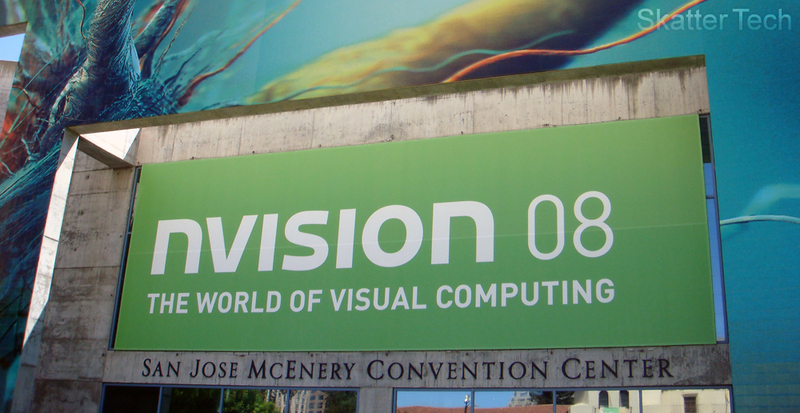 It was Nvidia’s and the CEO’s first time hosting such a large event. It went pretty well and looks like it was success so far. I’ll be on the show floor covering some of the new stuff that’s being shown off. So keep checking back for more Nvision 08 content over the next two days!